We are still adding to this section. Most parents feel like they are barely keeping their heads above water, when in fact, we are daily helping our kids in all kinds of ways. The brain is a wonderful thing, and new connections can be forged from our positive and creative parenting approaches. That said, it’s not easy to know what is best in such a rapidly changing environment. This list is incomplete – we will continue to add to this. Suggestions welcome! Oregon Behavior Consultation YouTube videos are an excellent source of information and practical tips. Broken Things, by Kathleen Fleming, 15 October 2015. This piece describes so beautifully some of the challenges of parenting, it also applies to kids with FASD. How to Help Someone Who Has a Fetal Alcohol Spectrum Disorder, by CPI Training and consulting in behavior management & dementia care. Guides for Parents, by Cerebra – a collection of health and social care information for the parents and carers of children aged 0-16 years with neurological conditions (not necessarily FASD specific), including info regarding legal issues, rights, education. Blogs written by families affected by FASD – it’s so important that we help others understand FASD, beyond the medical aspects. 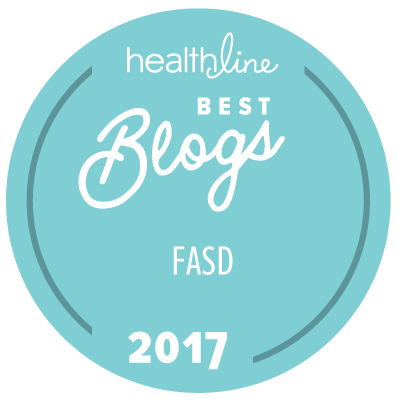 These bloggers help give insights into lives affected by FASD. This beautiful video is about the importance of diagnosis and the impact it can have on mothers/children, changing lives. Many parents have questions about what they should tell their children about their condition. This video by a woman who teaches kids with special needs, and who herself has learning disabilities, is inspiring. I was glad to see the title above BLOGS WRITTEN BY FAMILIES AFFECTED BY FASD instead of FASD Families. It takes longer but it is way better! I know it is an easier short hand to call our kids “FASD kids” and our families “FASD familes” but we and they are SO much MORE than that. Our kids all have aptitudes and strengths but it is darn hard to see these positives when they are FASD kids and we are FASD families. And no parent out there means to make any of this more difficult than it already is do we? We need to use person-first and family-first language. Otherwise it is harder to find the natural aptitudes our kids possess if all we see is their FASD. We can hardly expect the best from others when we don’t put it out there ourselves. Our children are affected by FASD, we have classrooms for students with FASD, and families dealing with FASD. It is harder but it works better.